It’s the color challenge over at Splitcoast Stampers today. 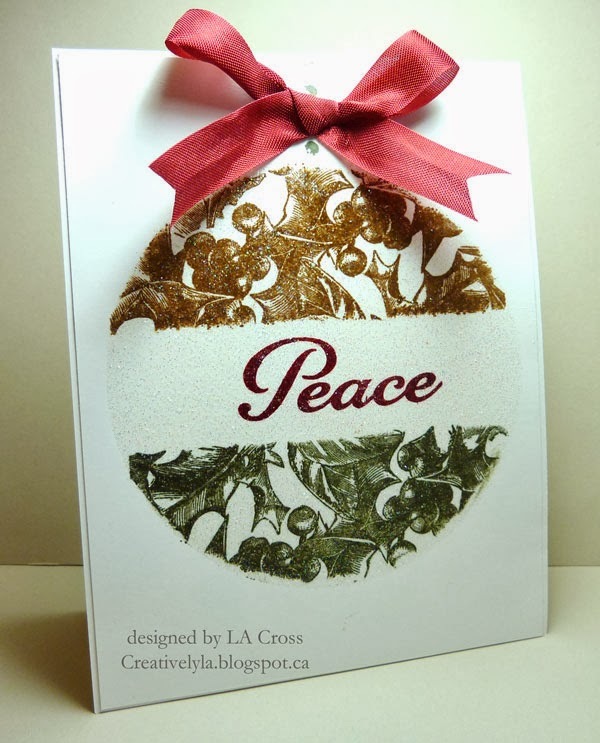 And some of my inspiration comes from the Holiday Card Workshop 2013 from Online Card Classes…stretching your stamps. In other words…think outside the box. I started out by cutting my own stencil from a piece of transparency…just a simple circle with my Spellbinders circle die and my Big Shot Pro. Then I taped it to my card with a piece of washi tape and placed a piece of removable wide tape across the center. Next I stamped the Anna Griffin holly image in Brushed Corduroy across the top and then repeated on the bottom part of the circle with Always Artichoke. Then, I lifted off the removable tape and stamped the Waltzingmouse Stamps sentiment in Cherry Cobbler. After I cleaned off my stencil (very important), I returned it to the same spot with tape and inked the entire circle with Versamark ink. Next, it was heat embossed with Iridescent Ice. I inked the top of my Quikstik pen with Always Artichoke and stamped the little chain at the top of the ornament and added a Cherry Cobbler bow. The ideas from the class did spark a little creativity…love that! Thanks for the directions, Lee Anne — because I'm going to CASE this beautiful card!